Tuesday 26 April 2011 – Ice Camp! First Sampling Day. Finally, the labs are set-up (took most of yesterday), all our gear is clean, organized, and ready for use, and was a sunny (almost 19 hours worth) and not too cold day, at least compared to wintertime temperatures. On the ice the temperature was 7°F (-14°C) and inside the tent, even without the heater, was a balmy 40°F (4.5°C). Compared to the temperatures we experienced in the winter, it was like a day at the beach. 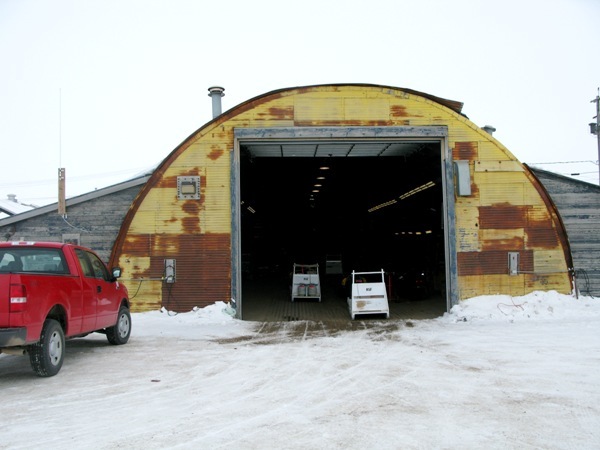 Building #36 – our field staging area. Actually, most of the building names are left over from the days when the lab site was operated as a Naval Research facility, so you can understand where the clever naming system came from. After suiting up and sorting out who was riding and who was driving, we headed out on the ice. Our destination was a site about 1.25 miles offshore that we had previously identified as a suitable sampling site that is oceanographically representative of the region. 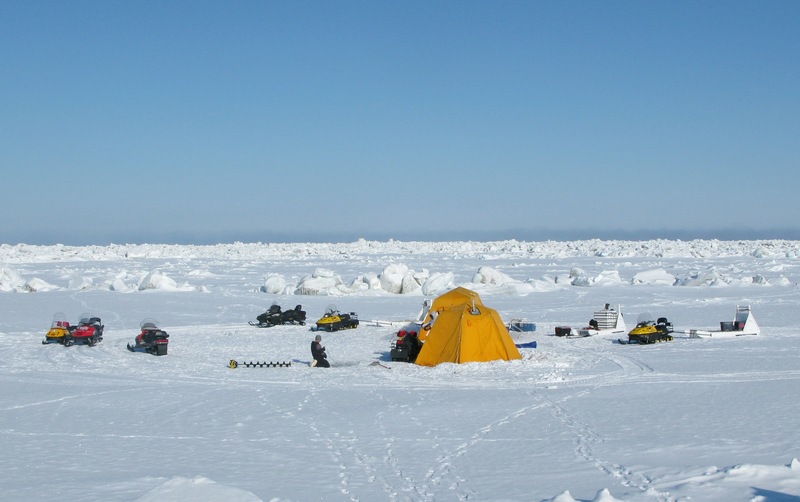 A lead team of UMIAQ support personnel and two of our group set-up the camp yesterday and made preliminary observations of ice thickness, light penetration, water temperature, etc. So when we arrived today we knew exactly what to do. Ice camp – April 2011 (71° 18’ 7”N 156° 43’ 16” W). Since we were able to use a trail cut by the Department of Wildlife (with help from our logistics team of Polar Field Services and UMIAQ) the ride out to our ice camp was surprisingly smooth given the roughness of the terrain around us. 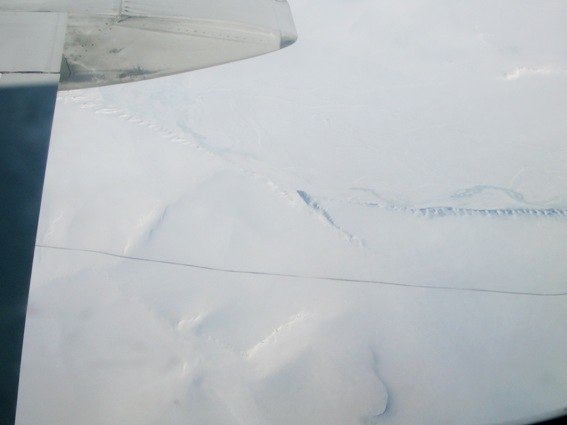 Actually, preparing ice trails is a major component of the logistics support needed to conduct our studies and required months of planning and work to complete. So we were especially grateful for how nice the trail was. Once we arrived on site (about 20 minutes after leaving building #36), we all got busy. 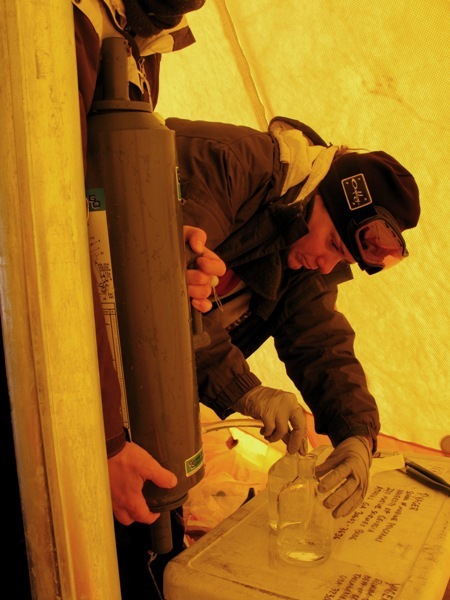 The Yager group immediately occupied the smaller of our two ice tents and began their intricate sampling procedure using a special collection bottle called a Niskin bottle. For those of you are not oceanographers, a Niskin bottle is a device used for obtaining seawater samples from a specific depth. The bottles were originally designed by the early 20thcentury Norwegian polar explorer and oceanographer Fridtjof Nansen and further developed and patented by Shale Niskin. By using this type of sampling device Tara and Karie are able to collect intact water samples without disturbing the water including the dissolved gases that they are especially interested in measuring. Tara and Karie sampling from a Niskin bottle. The rest of us occupied the second larger tent and utilized a specialized submersible pump to collect the larger volumes of water needed for our studies. Zac and Marc sampling – using a pump (photo by Lollie Garay). While we were all busy sampling the water underneath the ice, Lollie and Andriane were hard at it photographing us, the ice, under the ice, and everything else that caught their attention. Both Lollie and Andriane came equipped with underwater cameras which they deployed through an ice hole. Lollie is planning on posting some of her videos on our project’s website www.arcticnitro.org, so check it out if you’re interested. Everyone worked efficiently and by around 11:30am we were finished and headed back loaded down with carboys full of water. Since the assays and measurements we are making require that we process them as quickly as possible, we are always in a hurry to get the samples back to the lab. I didn’t fall off this time, but there was some excitement. Ask me about it sometime. Finally a little after noon we arrived safely back to the labs where we all quickly dispersed to process our samples. Zac and I spent the next 6 hours in the cold room filtering water and setting-up a new experiment designed to test the hypothesis that bacterial growth will be stimulated by the addition of humic acids as a carbon source but will need to assimilate additional nitrogen to do so. I’ve asked Zac to write a little bit in this blog to describe his experiment and its rationale in easily understood English, so stay tuned for that. After a quick dinner in town at the Brower Café (not Arctic Pizza for a change), it was back to the lab for a few more hours of lab work. As I was finishing the sun was just setting (11:45pm) providing the perfect ending to a long but exhilarating Arctic day. I’ll sleep well tonight for sure. Sleeping was tough last night as our bodies are still adjusting to all the sunlight. Despite being so tired I think both Zac and I had a hard time sleeping and woke early. Oh well, more time for work. Not all that much exciting to report for today. Most of the day was spent continuing to get our equipment together and getting ourselves organized for tomorrow’s main effort of setting the labs up and preparing for our first sampling trip on Tuesday. Field work is like that, lots of work punctuated by moments of exhilaration. Definitely a highlight of the day was Easter brunch in the cafeteria. Easter brunch in the cafeteria. 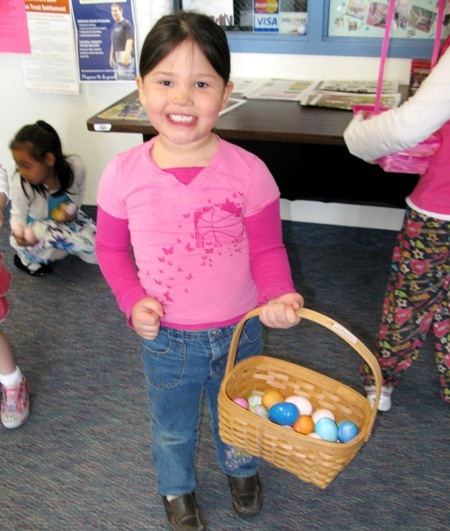 The staff had decorated to the nines and over 200 people, mostly locals with kids, showed-up to the feast and egg hunt. 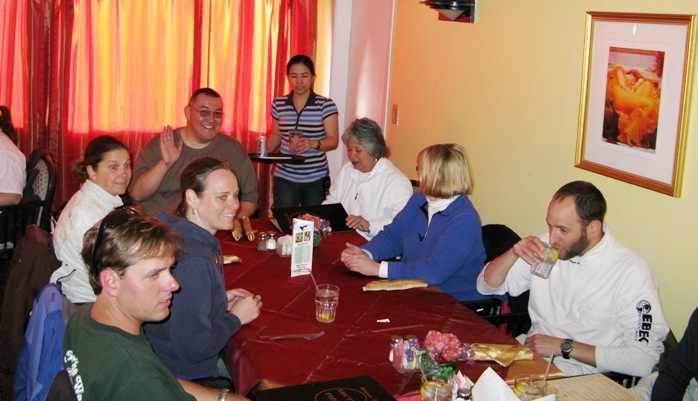 The food was good and plentiful and the atmosphere festive. David, my 3 year old son, would have really enjoyed it. I missed him a lot. The rest of our group arrived in the evening. It was quite a reunion. Joining us were Debbie Bronk, Quinn Roberts, Rachel Sipler, and Steven Baer from VIMS, Tara Connelly, Karie Sines, and Adrianne Colburn from UGA, and Lollie Garay from Red School in Houston. Miraculously everyone’s luggage arrived, even Zac’s luggage finally showed-up. After the airport it was straight to the local grocery store to pick up some supplies. Good news, the grocery store now carries some organic products. Bad news, they are incredibly expensive. Would you pay $9.45 for half a gallon of milk? 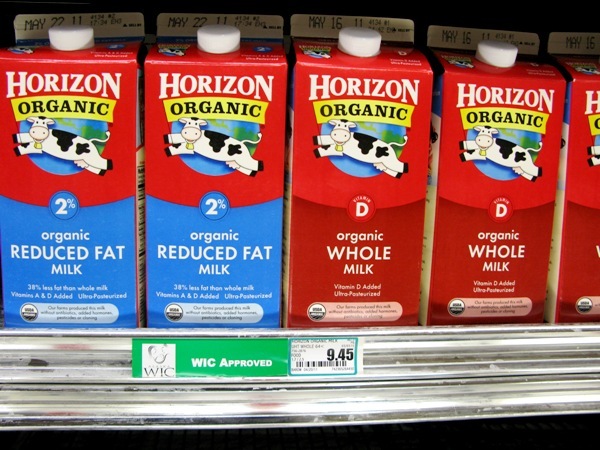 Organic milk, $9.45 a gallon. After shopping we all went out to dinner; can you guess where? Yep, Arctic Pizza. We tried to talk a bit of science and catch-up, but everyone was so tired it was all that most could do just to sit upright. I think Quinn even managed a few Z’s in her pizza. Group dinner at Arctic Pizza. But by staying up late we were rewarded with a truly amazing sunset. Tomorrow it’s another day of setting-up. Hi All, it’s back to Barrow Alaska for another sampling adventure. As I’ve discussed before in this blog, the intent of our project is to reach a new and quantitative understanding concerning how microbes (bacteria and phytoplankton) may respond to climate induced changes in the Arctic. Although there is a very strong consensus among scientists that the world’s climate is changing (For more information, see the footnote at the bottom of this posting. 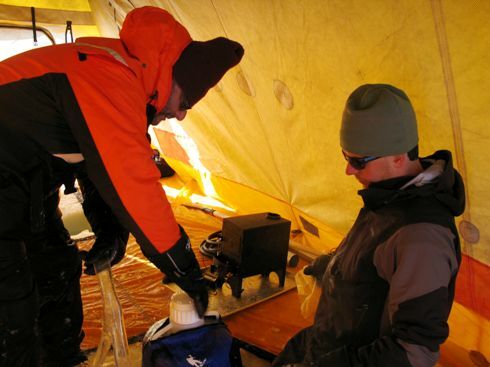 ), particularly in the Polar Regions, our understanding of how the organisms will respond is quite limited. At the base of the food web are the microbes and these are the primary focus of our investigations. These tiny organisms are responsible for at least half of the oxygen production (and consumption) on the planet, almost all of the nutrient regeneration, and are the food that support the diet of everything including, to name a few, fish, seals, whales, and humans. In other words, it’s very important that we understand how these microscopic organisms will respond to ongoing climate change, especially here in the Arctic. 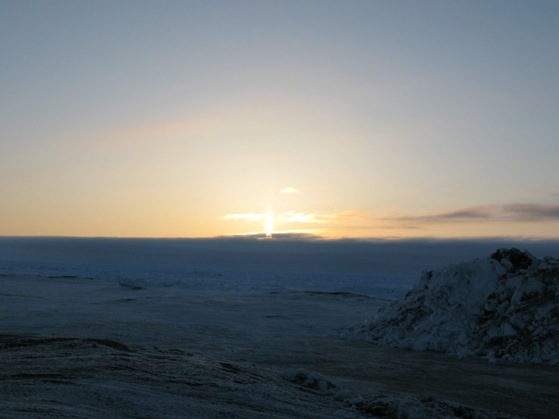 To answer these questions we are visiting the Arctic three times a year in the winter, spring, and summer, to make measurements of a large number of microbial parameters and to conduct experiments that will help us understand how the microbes may be affected by climate change. We are sampling at different seasons to account for the astounding amount of seasonal variation that occurs naturally during a year. 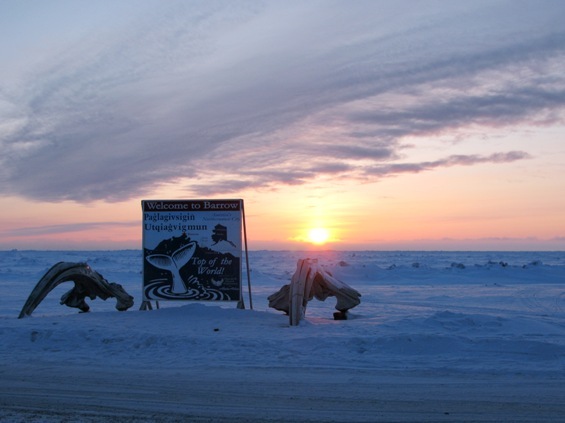 We can’t sample in the fall because that would interfere with whaling activities that are an important cultural component of the community in Barrow Alaska where our studies are being conducted. Our team includes scientists from the Skidaway Institute of Oceanography, the University of Georgia, and the Virginia Institute of Marine Sciences. In addition, on this trip a middle school teacher (Lolli Garay) from the Red School in Houston, Texas and an artist (Adriane Colburn) from the University of Georgia are joining us in an effort to help communicate and share information about our efforts and results outside of the science community. This springtime trip will be the fourth in our 3-year project and the second (and last) time during this project that we will sample during the spring. 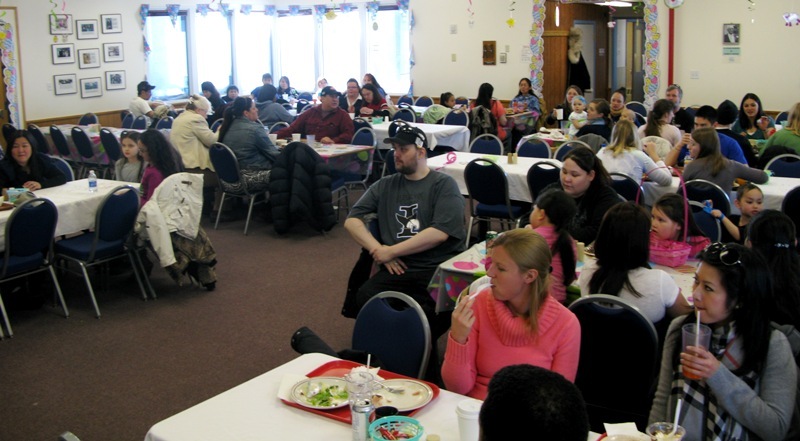 Although this is our fourth trip to Barrow Alaska and so a lot of what we are doing is starting to become routine, it still took a lot of planning to get ready for this trip. Since our return in February from our last trip, in addition to processing the winter samples, we’ve been busy planning and organizing the logistics for this trip. Victoria Baylor took charge of most of this effort. My graduate student from Savannah State University, Zac Tait, is also planning to start some new experiments related to his thesis research, so that took some additional planning efforts. Finally we were ready. This time we took a different route through Chicago to travel the 6,000 plus miles to Barrow. Map of route from Savannah GA to Barrow, AK. This route gets us to Barrow in a single day, but what a day! The way back will be worse though, with a 10-hour layover in Anchorage and another 5-hour layover in Chicago. But the route wasn’t without benefits as we were able to get a Chicago Hotdog for lunch. 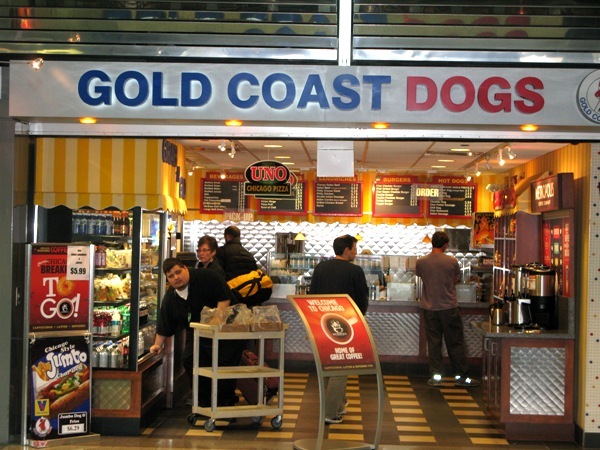 Lunch at Gold Coast Hot Dogs in Chicago’s O’Hare airport. Unfortunately, Zac lost his luggage along the way. Besides his clothes, Zac packed a number of important pieces of equipment in his bag so we’re really hoping it’s not lost forever. 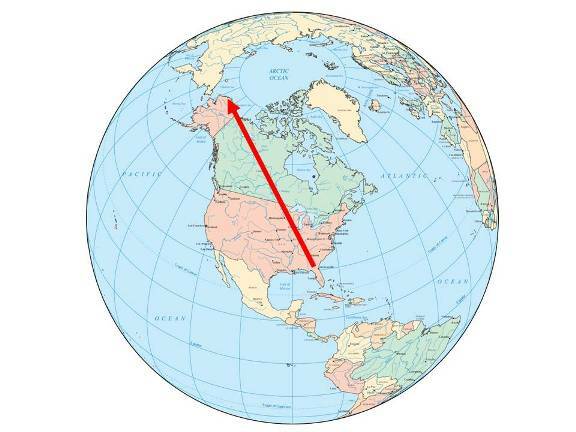 We made it to Barrow’s Will Rogers airport after a spectacular flight over Alaska’s Northslope passing over the frozen Yukon River and following the pipeline into Prudhoe Bay. 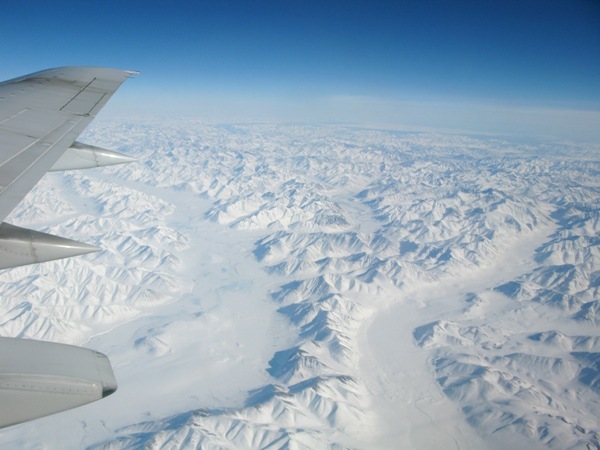 Alaska’s North Slope from the air. Alaska pipeline from the air. We arrived in Barrow in the early evening on Saturday but as we stepped off the plane it was immediately apparent how different it was compared to the winter. First of all, it was sunny! Last time we were here the sun was just appearing after 3 months of being absent. Although there was light, it was perpetual twilight time. Today there was 18 hours of sun and its light from about 2 am to 11:30 pm and on May 11, a week after we depart the sun will be up for 24 hours a day until the next sunset on August 1st. Its also considerably warmer though still well below freezing. Right now its -4°F (-20°C). There are also other very visible changes. 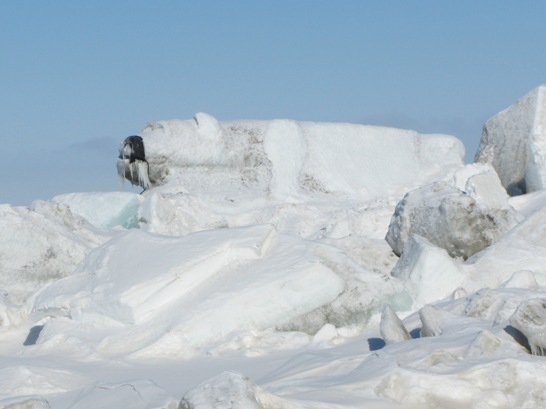 The sea ice is beginning to break-up and is piled-up on the beach as a result of past storms. The snow on the streets is also beginning to melt (because of all the sunlight) and the roads are dusty rather than snowy. 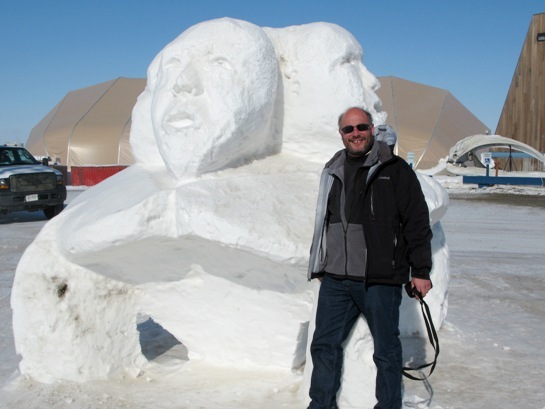 Other evidence of the long winter are several ice and snow carvings that have appeared around town, some rivaling Mount Rushmore but with a more Arctic theme. Ice carvings in downtown Barrow. Polar bear ice carving along the coastal road. But, despite the change of season returning to Barrow was a bit like coming home. We were picked-up at the airport by Tony Kaleak and Frantz Brower who are members of our logistic support group, UMIAQ. Tony and Brower (no one calls him Frantz) updated us on the recent gossip and many organizational changes that have occurred since we were last in town and got us checked in to our living and working quarters. The rest of the group won’t arrive until tomorrow evening so we set about surveying our equipment and space and planning for the next day. Around 8pm we called it quits got some dinner at our favorite Barrow restaurant “Arctic Pizza” and tried to sleep. It was tough though since the sun didn’t set until 11:30 and rose again around 2am. Sometimes scientific advances provide answers, and sometimes, they simply present more questions. That is what happened when scientists began using satellite imagery to study the ocean. When Skidaway Institute of Oceanography scientists Jim Nelson and Catherine Edwards looked at satellite imagery of the ocean off the Carolinas, they noticed persistent blooms of phytoplankton, an important part of the marine food web. These mysterious blooms occurred during the winter along edge of the continental shelf off Long Bay — located between Cape Romain, South Carolina and Cape Fear, North Carolina. Phytoplankton blooms like those observed off Long Bay can provide a considerable boost to the bottom of the food chain, with significant implications for fisheries. Two of the guiding questions are why this feature is so persistent over the winter, and what are the dynamics that sustain this bloom? Edwards and Nelson are teaming with Harvey Seim from the University of North Carolina and Fumin Zhang from Georgia Tech-Savannah on a project to answer those questions. The project is funded by a $1.6 million grant from the National Science Foundation supporting a team of scientists from all three institutions. With the help of Skidaway Institute research coordinators Trent Moore, Julie Amft and Charles Robertson, the project team will deploy moored and mobile instrument packages and conduct shipboard surveys to test hypotheses of how the winter blooms are formed and sustained. The team will use some cutting-edge technology that will enhance its ability develop a clear picture of what is happening. This includes instrument packages mounted on moorings; mobile, autonomous “gliders”; underway ship surveys; standard ship-based station sampling; and satellite measurements of sea surface temperature and ocean color. 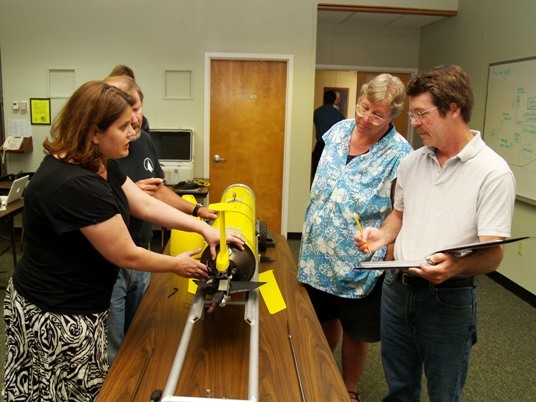 Skidaway Institute researchers (l-r) Catherine Edwards, Trent Moore, Julie Amft and Jim Nelson examine a glider. Three moored packages will be deployed to provide continuous measurements of water properties and currents through the winter months. One mooring will be placed at 35 meters of depth, the approximate position of the shoreward edge of the winter bloom. Two more packages will be placed in approximately 75 and 150 meters of water, with the 75 meter mooring equipped with an instrument package called a SeaHorse. Powered by wave motion, the Seahorse moves up and down its mooring wire, taking measurements throughout the water column. A telemetry system in the surface mooring periodically reports its observations. The research team will also use another high-tech tool, autonomous underwater vehicles, also called gliders. Two of these torpedo-shaped vehicles, equipped with sensors and recorders, will provide the ability to collect observations under all conditions, including during winter storms when ship operations are not possible. The gliders will survey across the study area, taking and recording measurements as they go. From time to time over the four to five week missions, they will surface, report their data by satellite phone and receive instructions as needed. The gliders will be controlled from shore with an autonomous glider control system co-developed by Fumin Zhang at Georgia Tech Savannah. Two Georgia Tech-Savannah graduate students, Klimka Szwaykowska and Dongsik Chang, are developing algorithms to optimize the glider sampling given real-time data collected by satellite, the SeaHorse profiler and the gliders themselves. 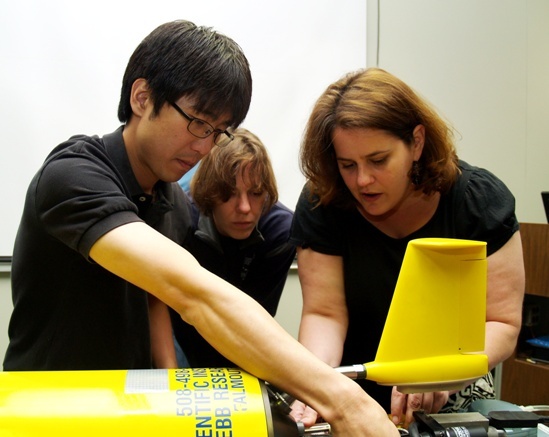 Catherine Edwards (r) and Dongsik Chang work on the tail of a glider while Klimka Szwaykowska looks on. Members of the research team will spend much of the winter of 2012 aboard the Skidaway Institute research vessel R/V Savannah, conducting experiments and collecting data. Armed with a better understanding of the physical processes that “fertilize” the outer shelf and how phytoplankton take advantage of the nutrient input, the research team will be able to answer larger questions about how biology and physics interact in Long Bay. The project will run for three years.